This is a dream ride through one of the most beautiful locations in the Alps. I would start just below Grindelwald. The route is well signed, and it’s important to follow these signs as there are lots of little super-steep roads/trails that detour off to chalets/farms along the way. 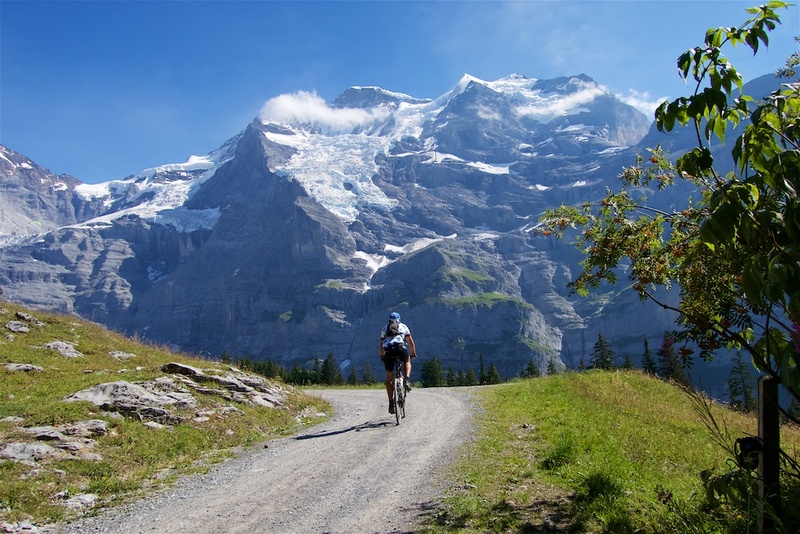 The ride runs under the length of the Eiger north face which dominates the views. It’s an amazing place. Roughly half way up, the road becomes less developed, even running through some light forest. It becomes unpaved above 1800 metres as the famous 19th century Kleine Scheidegg hotel Bellevue des Alpes comes into view. Since the 1930’s hotel guests have looked up with fascination as mountain climbers have tried – and often failed – to climb perhaps the most difficult and definitely the most famous mountain climb in Europe. At Kleine Scheidegg is a train station, several hotels, some stores and restaurants. A perfect place to enjoy a beer an the view of the three high peaks here: Eiger, Mönch and Jungfrau. 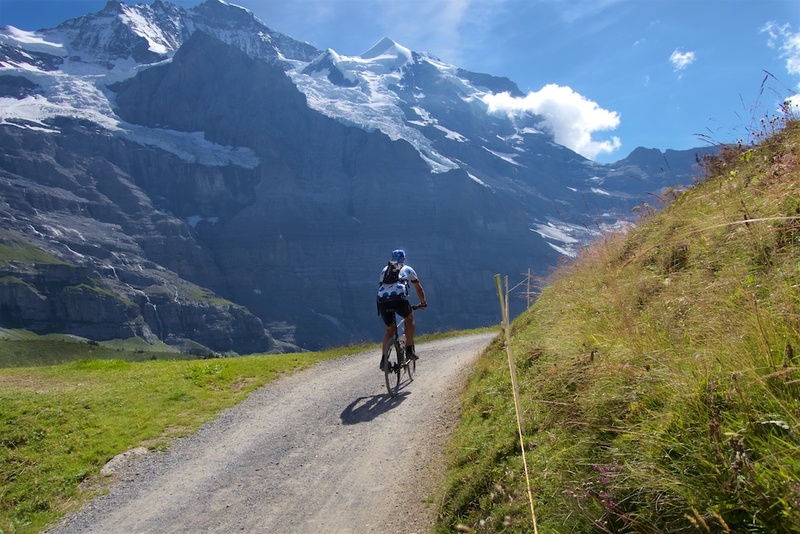 The signed mountain bike route descends from Kleine Scheidegg towards Wengen ski station. If anything, this side is even more spectacular. 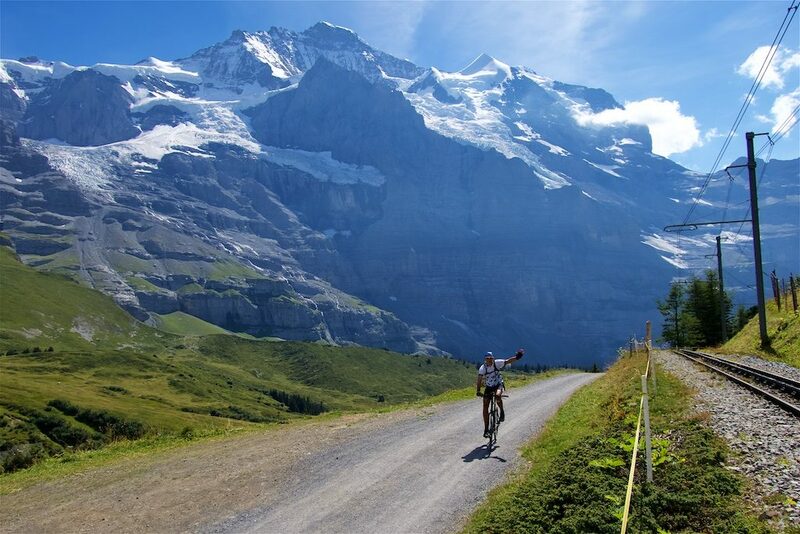 I would double back before reaching Wengen, allowing me to ride this great stretch of road twice. The map below is the above ride. 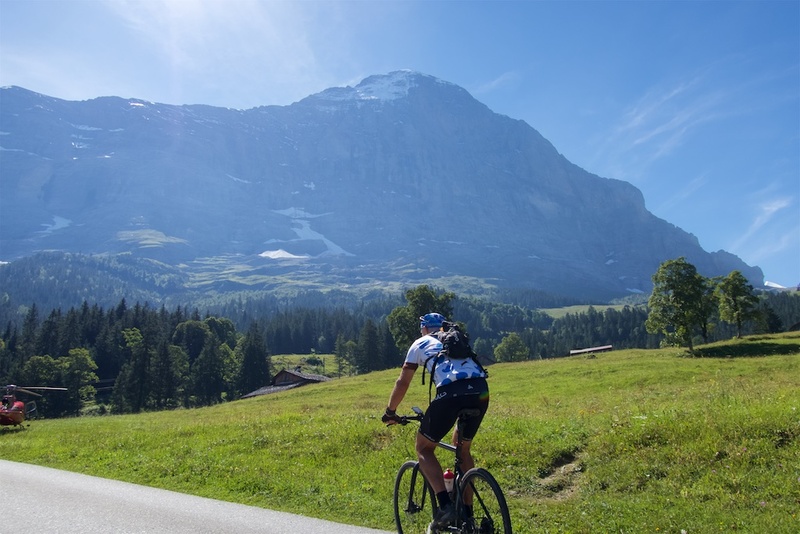 But if you are looking for a big loop, this link to an old ride includes map of a loop of Wengen, Kleine Scheidegg, Grindelwald, and Gündlischwand – as well as a detour up the fabulous (and challenging Grosse Scheidegg). Great article Will. 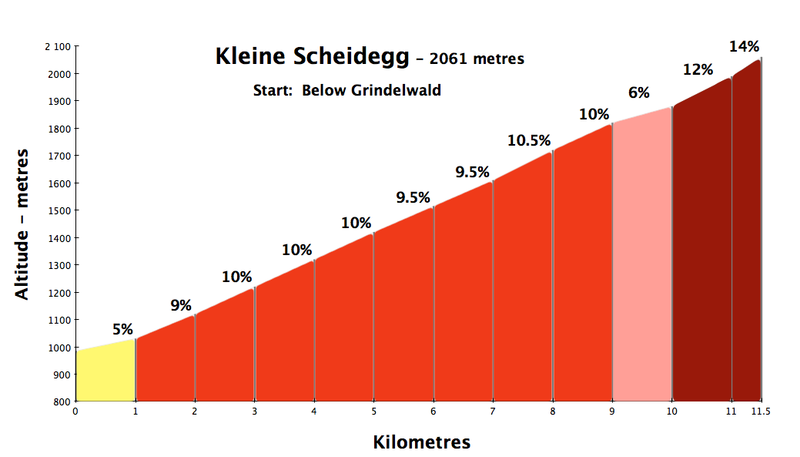 I was in Grindelwald with my road bike a few days ago. 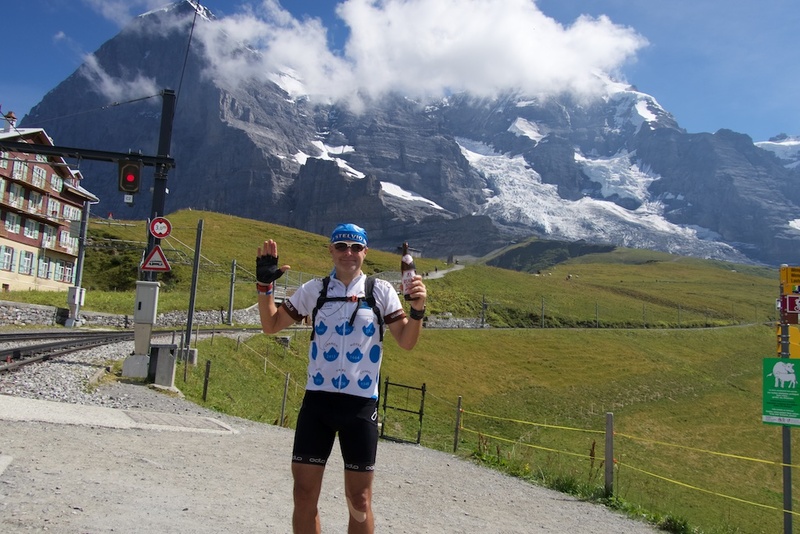 The track to Kleinne Scheidegg was too rough for road tyres so I took the train to see the Eiger. There’s a sealed road all the way to Grosse Scheidegg in the shadow of the Wetterhorn which is a nice roadie alternative. may i ask what device and software you used to have that 3d mountain effect and the yellow line showing the route you took? Hi Rich, the “movie” comes from https://www.relive.cc If you have a Strava.com account and you register with relive, they send an email yith a video after every ride. Thank you for all good posting, very helpful. I saw a comment in the thread that he didn’t ride it with his roadbike, is it your opinion to that is not doable? It’s always a tough question as it depends on how fussy you are. Generally, as I remember it, the gravel is pretty good except. Fine going up. Rougher descending. Quite a few photos above show unpaved surfaces. If you know what you’re getting into ….. you could gently use a road bike. Thanks for the answer. We will think about it. The opportunity to rent gravel bike just showed up, that will make it easier to decide. Happy biking and keep up the good writing you do.